This lab provides hands-on exercises that demonstrate how to debug the Sysvad audio kernel-mode device driver. 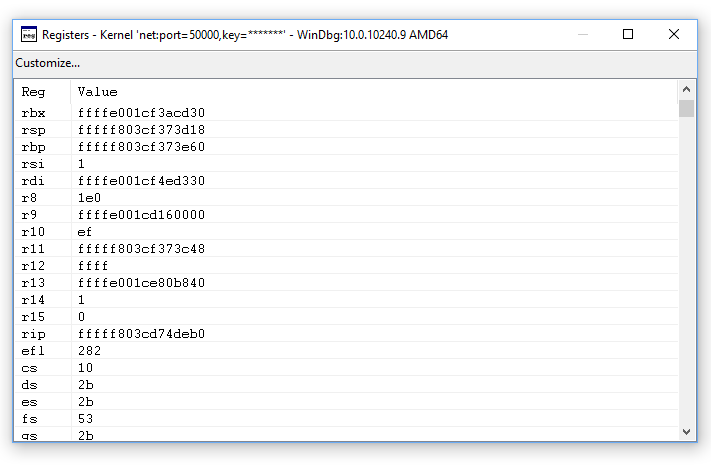 Microsoft Windows Debugger (WinDbg) is a powerful Windows-based debugging tool that you can use to perform user-mode and kernel-mode debugging. 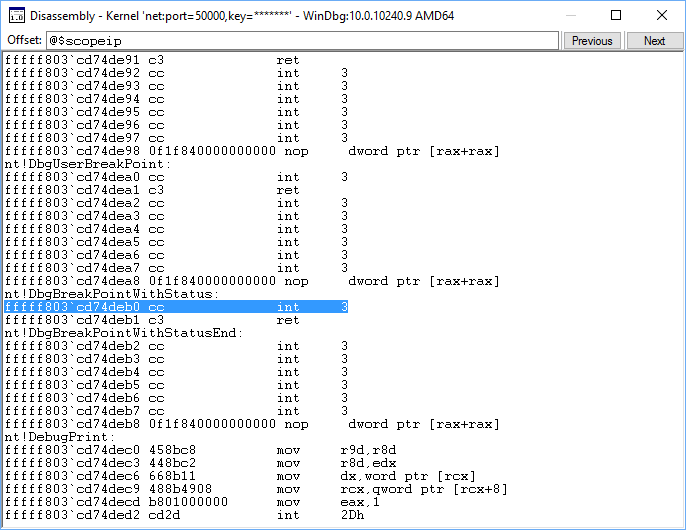 WinDbg provides source-level debugging for the Windows kernel, kernel-mode drivers, and system services, as well as user-mode applications and drivers. WinDbg can step through source code, set breakpoints, view variables (including C++ objects), stack traces, and memory. 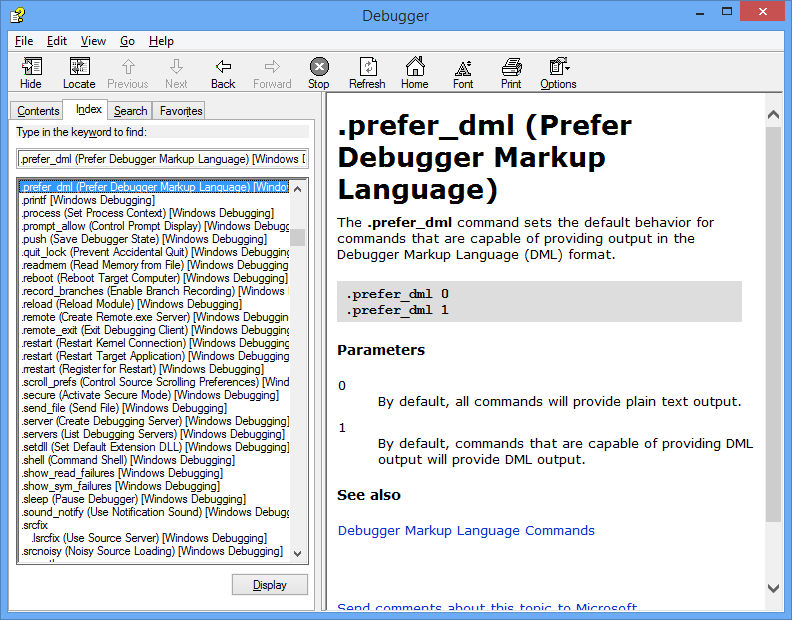 Its Debugger Command window allows the user to issue a wide variety of commands. You will need the following software to be able to complete the lab. For information on downloading and installing the WDK, see Download the Windows Driver Kit (WDK). The Echo driver is a simpler driver then the Sysvad audio driver. 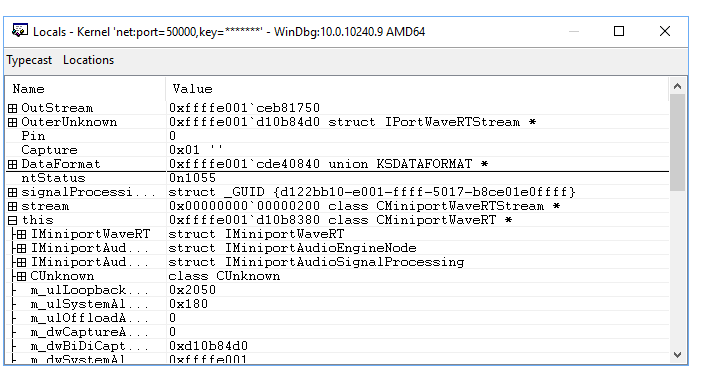 If you are new to WinDbg, you may want to consider first completing the Debug Universal Drivers - Step-by-Step Lab (Echo kernel mode). This lab reuses the setup directions from that lab, so if you have completed that lab you can skip sections 1 and 2 here. In Section 1, you will configure network debugging on the host and target system. The PCs in this lab need to be configured to use an Ethernet network connection for kernel debugging. This lab uses two computers. WinDbg runs on the host system and the Sysvad driver runs on the target system. Use a network hub/router and network cables to connect the two PCs. To work with kernel-mode applications and use WinDbg, we recommend that you use the KDNET over Ethernet transport. For information about how to use the Ethernet transport protocol, see Getting Started with WinDbg (Kernel-Mode). 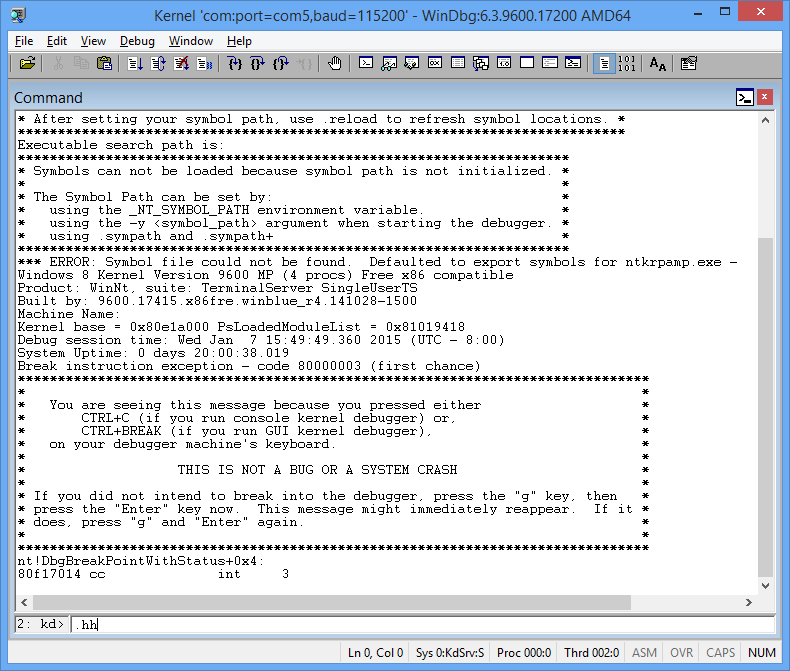 For more information about setting up the target computer, see Preparing a Computer for Manual Driver Deployment and Setting Up KDNET Network Kernel Debugging Automatically. To enable kernel-mode debugging on the target system, perform the following steps. Open a command prompt on the host system and type ipconfig /all to determine its IP address. Open a command prompt on the target system and use the ping command to confirm network connectivity between the two systems. Use the actual IP address of the host system you recorded instead of 169.182.1.1 that is shown in the sample output. To use the KDNET utility to enable kernel-mode debugging on the target system, peform the following steps. On the host system, locate the WDK KDNET directory. By default it is located here. This labs assumes that both PCs are running a 64 bit version of Windowson both the target and host. If that is not the case, the best approach is to run the same "bitness" of tools on the host that the target is running. For example if the target is running 32 bit Windows, run a 32 version of the debugger on the host. For more information, see Choosing the 32-Bit or 64-Bit Debugging Tools. Locate these two files and copy them to a network share or thumb drive, so that they will be available on the target computer. On the target computer, open a Command Prompt window as Administrator. Enter this command to validate that the NIC on the target PC is suported. Type this command to set the IP address of the host system. Use the actual IP address of the host system you recorded instead of 169.182.1.1 that is shown in the sample output. Pick a unique port address for each target/host pair that you work with, such as 50010. Enabling network debugging on Intel(R) 82577LM Gigabit Network Connection. Copy the auto generated unique key into a text file, to avoid having to type it in on the host PC. Copy the text file with the key over to the host system. 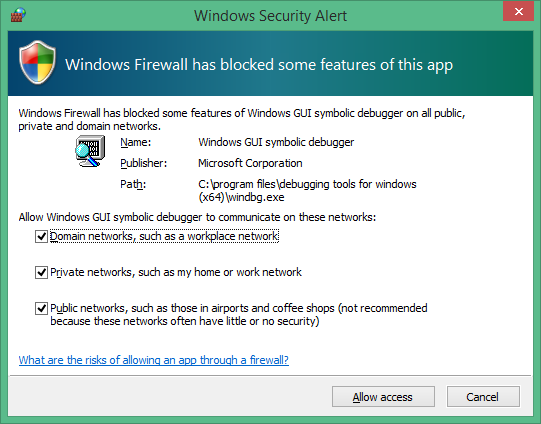 If you receive a pop-up message from the firewall, and you wish to use the debugger, check all three of the boxes. On the host computer, open a Command Prompt window as Administrator. Change to the WinDbg.exe directory. We will use the x64version of WinDbg.exe from the Windows Driver Kit (WDK) that was installed as part of the Windows kit installation. Launch WinDbg with remote user debug using the following command. The value for the key and port match what you set earlier using BCDEdit on the target. In a minute or two, debug output should be displayed on the host system. The Debugger Command window is split into two panes. You type commands in the smaller pane (the command entry pane) at the bottom of the window and view the command output in the larger pane at the top of the window. In Section 2, you will use debug commands to display information about the target system. Some debug commands display text using Debugger Markup Language that you can click on to quickly gather more information. Use Ctrl+Break (Scroll Lock) in WinDBg to break into the code running on the target system. It may take a bit of time for the target system to respond. Type the following command to enable DML in the Debugger Command window. You can access reference command help using the .hh command. Type the following command to view the command reference help for .prefer_dml. The Debugger help file will display help for the .prefer_dml command. Display detailed version information on the target system by typing the vertarget (Show Target Computer Version) command in the WinDbg window. You can verify that you are working with the right kernel-mode process by displaying the loaded modules by typing the lm (List Loaded Modules) command in the WinDbg window. Note Output that has been omitted is indicated with "… " in this lab. Because we have yet to set the symbol path and loaded symbols, limited information is available in the debugger. In Section 3, you will download and build the Sysvad audio driver. Typically, you would be working with your own driver code when you use WinDbg. To become familiar with debugging audio drivers, the Sysvad virtual audio sample driver is used. This sample is used to illustrate how you can single step through native kernel-mode code. This technique can be very valuable for debugging complex kernel-mode code issues. To download and build the Sysvad sample audio driver, perform the following steps. This lab, shows how to download the universal driver samples in one zip file. a. Download the master.zip file to your local hard drive. b. Right-click Windows-driver-samples-master.zip, and choose Extract All. Specify a new folder, or browse to an existing one that will store the extracted files. For example, you could specify C:\WDK_Samples\ as the new folder into which the files are extracted. c. After the files are extracted, navigate to the following subfolder. In Visual Studio, click File > Open > Project/Solution... and navigate to the folder that contains the extracted files (for example, C:\WDK_Samples\Sysvad). Double-click the Syvad solution file. 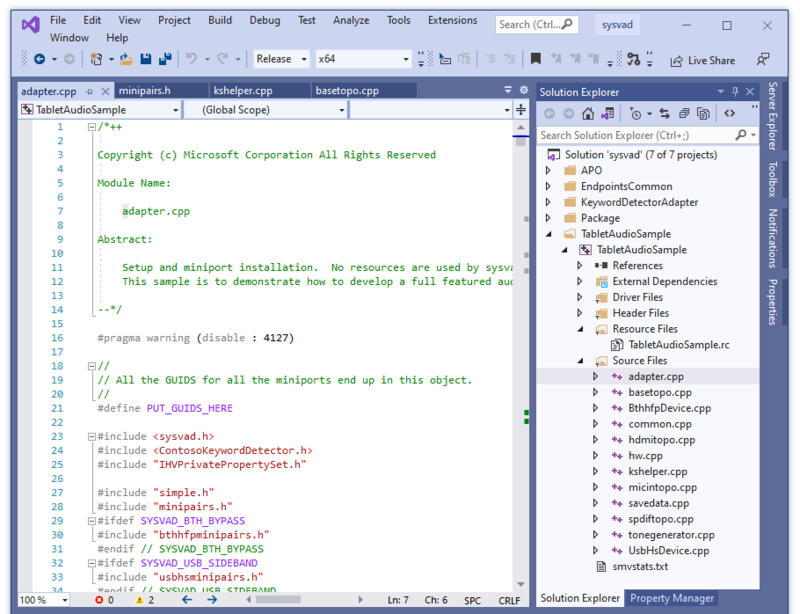 In Visual Studio locate the Solution Explorer. (If this is not already open, choose Solution Explorer from the View menu.) In Solution Explorer, you can see one solution that has a number of projects and what is included in the sample changes from time to time. In Solution Explorer, right-click Solution 'sysvad' (7 projects), and choose Configuration Manager. Make sure that the configuration and platform settings are the same for the four projects. By default, the configuration is set to "Win10 Debug", and the platform is set to "Win64" for all the projects. If you make any configuration and/or platform changes for one project, you must make the same changes for the remaining three projects. Note This lab assumes that 64 bit Windows is being used. If you are using 32 bit Windows, build the driver for 32 bit. Locate the TabletAudioSample. Open the Sysvad driver’s property page and make sure Driver Signing > Sign Mode is set to Test Sign. In Visual Studio, click Build > Build Solution. The build windows should display a message indicating that the build for all six projects succeeded. In File Explorer, navigate to the folder that contains the extracted files for the sample. For example, you would navigate to C:\WDK_Samples\Sysvad, if that's the folder you specified earlier. Within that folder, the location of the compiled driver files varies depending on the configuration and platform settings that you selected in the Configuration Manager. For example, if you left the default settings unchanged, then the compiled driver files will be saved to a folder named \x64\Debug for a 64-bit, debug build. C:\WDK_Samples\Sysvad\TabletAudioSample\x64\Debug. The folder will contain the TabletAudioSample .SYS driver, symbol pdp file and the inf file. You will also need to locate the SwapAPO, and KeywordDetectorContosoAdapter dlls and symbol files. To install the driver, you will need the following files. TabletAudioSample.pdb The driver symbol file. tabletaudiosample.inf An information (INF) file that contains information needed to install the driver. KeywordDetectorContosoAdapter.dl A sample keyword detector. KeywordDetectorContosoAdapter.pdb The sample keyword detector symbol file. lSwapAPO.dll A sample driver extension for a UI to manage APOs. lSwapAPO.pdb The APO UI symbol file. TabletAudioSample.cer The TabletAudioSample certificate file. Locate a USB thumb drive or set up a network share to copy the built driver files from the host to the target system. In the next section, you will copy the code to the target system, and install and test the driver. In Section 4, you will use devcon to install the Sysvad audio driver. The computer where you install the driver is called the target computer or the test computer. Typically, this is a separate computer from the computer on which you develop and build the driver package. The computer where you develop and build the driver is called the host computer. The process of moving the driver package to the target computer and installing the driver is called deploying the driver. You can deploy the sample Sysvad driver, automatically or manually. Before you manually deploy a driver, you must prepare the target computer by turning on test signing. You also need to locate the DevCon tool in your WDK installation. After that you’re ready to run the built driver sample on the target system. To install the driver on the target system, perform the following steps. In Update and Security, select Recovery. When the PC restarts, select Troubleshoot. Then select Advanced options, Startup Settings and then click Restart. Select Disable driver signature enforcement by pressing the F7 key. The PC will start with the new values in place. The following instructions show you how to install and test the sample driver. The INF file required for installing this driver is TabletAudioSample.inf. On the target computer, open a Command Prompt window as Administrator. Navigate to your driver package folder, right-click the TabletAudioSample.inf file, and then select Install. 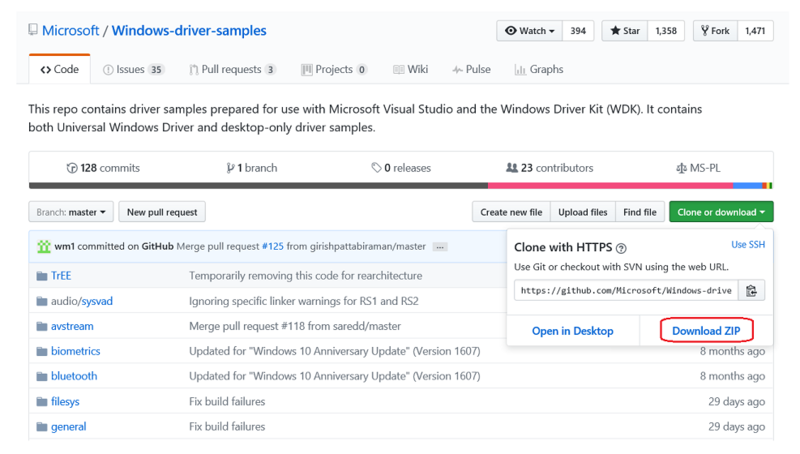 For more detailed instructions, see Configuring a Computer for Driver Deployment, Testing, and Debugging. Status information is displayed durring the devcon install. On the target computer, in a Command Prompt window, enter devmgmt to open Device Manager. In Device Manager, on the View menu, select Devices by type. In the device tree, locate Virtual Audio Device (WDM) - Tablet Sample in the Audio Device node. This is typically under the Sound, video and game controllers node. Confirm that it is installed and active. 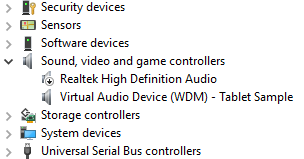 Highlight the driver for the actual hardware on the PC in Device Manager. Then right-click the driver and click disable to disable the driver. Confirm in Device Manager that audio hardware driver, displays the a down arrow, indicating that it is disabled. After successfully installing the sample driver, you're now ready to test it. On the target computer, in a Command Prompt window, enter devmgmt to open Device Manager. In Device Manager, on the View menu, select Devices by type. In the device tree, locate Virtual Audio Device (WDM) - Tablet Sample. Open Control Panel and navigate to Hardware and Sound > Manage audio devices. In the Sound dialog box, select the speaker icon labeled as Virtual Audio Device (WDM) - Tablet Sample, and then click Set Default, but do not click OK. This will keep the Sound dialog box open. Locate an MP3 or other audio file on the target computer and double-click to play it. Then in the Sound dialog box, verify that there is activity in the volume level indicator associated with the Virtual Audio Device (WDM) - Tablet Sample driver. In Section 5, you will set the symbol path and use kernel debugger commands to display information about the Sysvad sample driver. Symbols allow for WinDbg to display additional information such as variable names, that can be invaluable when debugging. 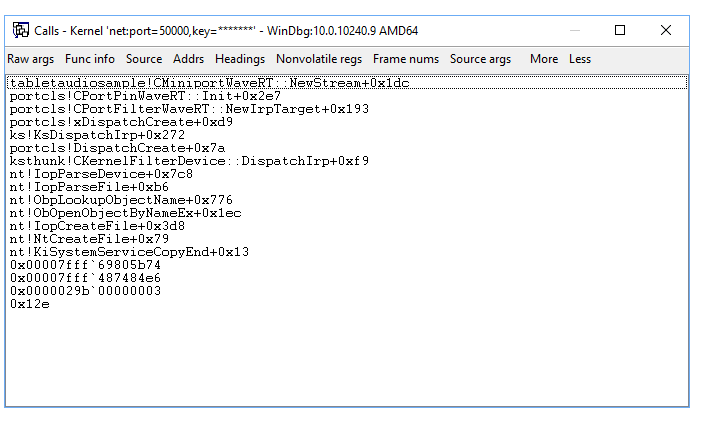 WinDbg uses the Microsoft Visual Studio debug symbol formats for source-level debugging. It can access any symbol or variable from a module that has PDB symbol files. To load the debugger, perform the following steps. If you closed the debugger, open it again using the following command in the administrator command prompt window. Replace the key and port with what you previously configured. Use Ctrl+Break (Scroll Lock) to break into the code running on the target system. To set the symbols path to the Microsoft symbol server in the WinDbg environment, use the .symfix command. To add your local symbol location to use your local symbols, add the path using .sympath+ and then .reload /f. Note The .reload command with the /f force option deletes all symbol information for the specified module and reloads the symbols. In some cases, this command also reloads or unloads the module itself. Note You must load the proper symbols to use advanced functionality that WinDbg provides. If you do not have symbols properly configured, you will receive messages indicating that symbols are not available when you attempt to use functionality that is dependent on symbols. Type “.hh dbgerr005” for details. There are a number of approaches that can be used to work with symbols. In many situations, you can configure the PC to access symbols from a symbol server that Microsoft provides when they are needed. This walkthrough assumes that this approach will be used. If the symbols in your environment are in a different location, modify the steps to use that location. For additional information, see Symbol Stores and Symbol Servers. To perform source debugging, you must build a checked (debug) version of your binaries. The compiler will create symbol files (.pdb files). These symbol files will show the debugger how the binary instructions correspond to the source lines. The actual source files themselves must also be accessible to the debugger. The symbol files do not contain the text of the source code. For debugging, it is best if the linker does not optimize your code. Source debugging and access to local variables are more difficult, and sometimes nearly impossible, if the code has been optimized. If you are having problems viewing local variables or source lines, set the following build options. Type the following in the command area of the debugger to display information about the Sysvad driver. For more information, see lm. Click the Browse all global symbols link in the debug output to display information about items symbols that start with the letter a. Because DML is enabled, some elements of the output are hot links that you can click on. Click on the data link in the debug output to display information about items symbols that start with the letter a. For information, see x (Examine Symbols). The !lmi extension displays detailed information about a module. Type !lmi tabletaudiosample. Your output should be similar to the text shown below. Use the !dh extension to display header information as shown below. In Section 6, you will display information about the Sysvad sample device driver and where it lives in the Plug and Play device tree. Information about the device driver in the Plug and Play device tree can be useful for troubleshooting. For example, if a device driver is not resident in the device tree, there may an issue with the installation of the device driver. For more information about the device node debug extension, see !devnode. To see all the device nodes in the Plug and Play device tree, enter the !devnode 0 1 command. This command can take a minute or two to run. During that time, "*Busy" will be displayed in the status area of WinDbg. Use Ctrl+F to search in the output that is generated to look for the name of the device driver, sysvad. A device node entry with a name of sysvad_TabletAudioSample will be present in the !devnode output for Syvad. Note that the PDO address and the DevNode address are displayed. Use the !devnode 0 1 sysvad_TabletAudioSample command to display Plug and Play information associated with our Sysvad device driver. The output displayed in the previous command includes the PDO associated with the running instance of our driver, in this example it is 0xffffe00089c575a0. Enter the !devobj<PDO address> command to display Plug and Play information associated with the Sysvad device driver. Use the PDO address that !devnode displays on your PC, not the one shown here. The output displayed in the !devobj command includes the name of the attached device: \Driver\sysvad_tabletaudiosample. Use the !drvobj command with a bit mask of 2, to display information associated with the attached device. Enter the !devstack<PDO address> command to display Plug and Play information associated with the device driver. The output displayed in the !devnode 0 1 command includes the PDO address associated with the running instance of our driver. In this example it is 0xffffe00089c575a0. Use the PDO address that !devnode displays on your PC, not the one shown below. The output shows that we have a farily simple device driver stack. The sysvad_TabletAudioSample driver is a child of the PnPManager node. The PnPManager is a root node. 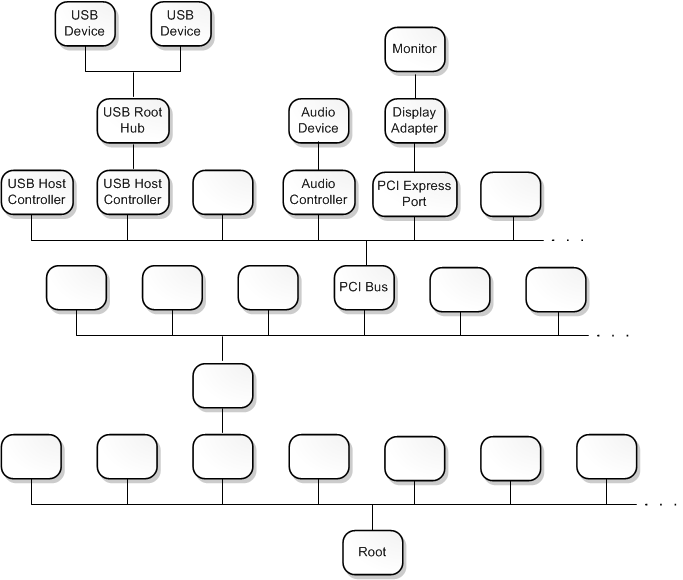 This diagram shows a more complex device node tree. Note For more information about more complex driver stacks, see Driver stacks and Device nodes and device stacks. In Section 7, you will work with breakpoints to stop code execution at specific points. Breakpoints are used to stop code execution at a particular line of code. You can then step forward in the code from that point, to debug that specific section of code. To set a breakpoint using a debug command, use one of the following b commands. Sets a breakpoint that will be active until the module it is in is unloaded. Sets a breakpoint that is unresolved when the module is unloaded and re-enables when the module reloads. Sets a breakpoint for a symbol. This command will use bu or bp appropriately and allows wildcards * to be used to set breakpoints on every symbols that matches (like all methods in a class). Use the WinDbg UI to confirm that Debug > Source Mode is enabled in the current WinDbg session. Add your local code location to the source path by typing the following command. Add your local symbol location to the symbol path by typing the following command. As you are working with a driver it can be handy to see all of the messages that it may display. Type the following to change the default debug bit mask so that all debug messages from the target system will be displayed in the debugger. Set the breakpoint with the bm command using the name of the driver, followed by the function name (AddDevice) where you want to set the breakpoint, separated by an exclamation mark. You can use different syntax in conjunction with setting variables like <module>!<symbol>, <class>::<method>,‘<file.cpp>:<line number>’, or skip a number of times <condition> <#>. For more information, see Using Breakpoints. List the current breakpoints to confirm that the breakpoint was set by typing the bl command. Restart code execution on the target system by typing the go command g.
In Windows, open Device Manager by using the icon or by entering mmc devmgmt.msc. In Device Manager expand the Sound, video and game controllers node. Right click the virtual audio driver entry and select Disable from the menu. Right click the virtual audio driver entry again and select Enable from the menu. This should cause Windows to reload the driver, which calls AddDevice. This will cause the AddDevice debug breakpoint to fire and the execution of the driver code on the target system should halt. // Allow three (3) Bluetooth hands-free profile devices. // Tell the class driver to add the device. Step line-by-line through the code by typing the p command or pressing F10. You can step forward out of the sysvad AddDevice code to PpvUtilCall, PnpCallAddDevice and then to the PipCallDriverAddDevice Windows code. You can provide a number to the p command to step forward multiple lines, for example p 5. When you are done stepping through the code, use the go command g to restart execution on the target system. You can also set breakpoints that fire when a memory location is accessed. Use the ba (break on access) command, with the following syntax. For example, to set a read/write breakpoint on a specific memory address, use a command like this. You can modify existing breakpoints by using the following commands. Clears a breakpoint from the list. Use bc * to clear all breakpoints. Disables a breakpoint. Use bd * to disable all breakpoints. Enables a breakpoint. Use be * to enable all breakpoints. Alternatively, you can also modify breakpoints by clicking edit > breakpoints. Note that the breakpoint dialog box only works with existing breakpoints. New breakpoints must be set from the command line. Different parts of the audio driver code is called to respond to various events, after the device driver is loaded. In the next section, we set a breakpoint that will fire when the user adjusts the volume control for the virtual audio driver. To set a breakpoint on MixerVolume, perform the following steps. To locate the method that changes the volume, use the x command to list the symbols in CAdapterCommon, that contain the string volume. Use CTRL+F to search upward in the output for volume and locate the MixerVolumeWrite method. Clear the previous breakpoints using bc *. Set a symbol breakpoint on the CAdapterCommon::MixerVolumeWrite routine using the following command. List the breakpoints to confirm that the breakpoint is set properly. In Control Panel select Hardware and Sound >Sound. Right click Sink Description Sample and select Properties. Select the Levels tab. Adjust the slider volume. This should cause the SetMixerVolume debug breakpoint to fire and execution of the driver code on the target system should halt. Use the dv command to display the current variables and their values. More information on variables is provided in the next section of this lab. Press F10 to single step through the code. Press F5 to finish the execution of the MixerVolumeWrite code. The following are the commands that you can use to step through your code (with the associated keyboard short cuts shown in parentheses). Break in (Ctrl+Break) - This command will interrupt a system as long as the system is running and is in communication with WinDbg (the sequence in the Kernel Debugger is Ctrl+C). Step over (F10) – This command causes code execution to proceed one statement or one instruction at a time. If a call is encountered, code execution passes over the call without entering the called routine. (If the programming language is C or C++ and WinDbg is in source mode, source mode can be turned on or off using Debug>Source Mode). Step in (F11) – This command is like step-over, except that the execution of a call does go into the called routine. Step out (Shift+F11) – This command causes execution to run to and exit from the current routine (current place in the call stack). This is useful if you've seen enough of the routine. Run to cursor (F7 or Ctrl+F10) – Place the cursor in a source or disassembly window where you want the execution to break, then press F7; code execution will run to that point. Note that if the flow of code execution does not reach the point indicated by the cursor (e.g., an IF statement isn't executed), WinDbg would not break, because the code execution did not reach the indicated point. Run (F5) – Run until a breakpoint is encountered or an event like a bug check occurs. Set instruction to the current line (Ctrl+Shift+I) – In a source window, you can place your cursor on a line, enter this keyboard shortcut, and code execution will start from that point as soon as you let it proceed (for example using F5 or F10). This is handy if you want to retry a sequence, but it requires some care. For example, registers and variables are not set to what they would be if code execution had reached that line naturally. Direct setting of the eip register -- You can put a value into the eip register, and as soon as you press F5 (or F10, F11, etc. ), execution commences from that address. This is similar to setting instruction to the cursor-designated current line, except that you specify the address of an assembly instruction. .lines - Enable source line information. bp main - Set the initial breakpoint at the beginning of your module. l+t - Stepping will be done by source line. Select Debug>Source Mode to enter source mode; the L+t command is not sufficient. l+s - Source lines will be displayed at prompt. g - Run program until "main" is entered. p - Execute one source line. For more information, see Source Code Debugging in WinDbg in the debugging reference documentation. You can set a breakpoint in code by adding the DebugBreak() statement and rebuilding the project and re-installing the driver. This breakpoint will fire each time the driver is enabled, so it would be a techniques to be used in the early development stages, not in production code. This technique is not as flexible as dynamically setting breakpoints using the breakpoint commands. Tip: You may want to keep a copy of the Sysvad driver with out the breakpoint added for further lab work. Set a break to occur each time the AddDevice method is run by adding the DebugBreak() statement to the sample code. // Insert the DebugBreak() statment before the  PcAddAdapterDevice is called. Follow all of the steps previously described to rebuild the driver in Microsoft Visual Studio and re-install it to the target machine. Be sure to uninstall the existing driver before installing the updated driver. Clear any previous breakpoints and make sure that the debugger is attached to the target PC. When the code runs and reaches the DebugBreak statement, execution will stop and a message will be displayed. In Section 8, you will use debugger commands to display variables. It can be useful to examine variables as the code executes to confirm that the code is working as expected. This labs examines variables as the audio driver produces sound. Use the dv command to examine the locale variables associated with the tabletaudiosample!CMiniportWaveRT::New*. Set a symbol breakpoint on the CMiniportWaveCyclicStreamMSVAD routines using the following command. Locate a small media file (such as Windows notification sound file with a .wav file extension) and click the file to play it. For example you can use Ring05.wav located in the Windows\Media directory. When the media file is played, the breakpoint should fire, and execution of the driver code on the target system should halt. The source code Window should be highlighting the brace on the entrance to the NewStream function. You can display the names and values of all local variables for a given frame by typing the dv command. To use DML to explore variables, click the underlined elements. The click action builds a dx (Display NatVis Expression) command that allows you to drill down on nested data structures. You can find the memory location of a global variable by typing ? <variable name>. This returns the memory location of the variable, in this case ffffd001`c8acd348. You can view the contents of the memory location by dumping the value of that location typing the dd command using the memory location returned by the previous command. You can also use variable names with the dd command. Use the View> Locals menu item to display local variables. This interface also provides this ability to drill down on more complex data structures. Use p or F10 to step forward about 10 lines in the code until you are highlighting the ntStatus = IsFormatSupported(Pin, Capture, DataFormat); line of code. // If the data format attributes were specified, extract them. // Check if we have enough streams. // Determine if the format is valid. Use the dv command to display the names and values of all local variables for a given frame. Note that, as expected, the values are different from the last time we ran this command, as additional code has been run that changes the local variables and some variables are now not in the current frame or their values have changed. In Section 9, you will view call stacks to examine caller/calle code. The call stack is the chain of function calls that have led to the current location of the program counter. The top function on the call stack is the current function, and the next function is the function that called the current function, and so on. Displays the stack and first three parameters. Displays the stacks and the full list of parameters. Allows you to see the stack with the frame information next to it. If you want to keep the call stack available, you can click View> Call stack to view it. Click the columns at the top of the window to toggle the display of additional information. This output shows the call stack while debugging the sample adapter code in a break state. You can use DML to further explore the code. When you click on the first 00 entry, the .frame (Set Local Context) command is used to set the context and then, the dv (Display Local Variables) command displays the local variables. In Section 10, you will use debugger commands to display processes and threads. To change the current process context, use the .process <process> command. The following example demonstrates how to identify a process and switch context to it. Use the !process command to display the current process that is involved in playing the sound. The output shows that the process is associated with audiodg.exe. If you are still at the breakpoint described in the previous section of this topic, the current process should be associated with the audiodg.exe image. VadRoot ffffe001d4222f70 Vads 70 Clone 0 Private 504. Modified 16. Locked 0. Note that one of the threads associated with this process is in the RUNNING state. This thread was supporting the playing of the media clip when the breakpoint was hit. Use the !process 0 0 command to display summary information for all processes. In the command output use CTRL+F to locate the process ID for the process associated with the audiodg.exe image. In the example shown below, the process ID is ffffe001d147c840. Enter g into the debugger to run the code forward until the media clip is done playing. Then break in to the debugger, by pressing Ctrl+ScrLk (Ctrl+Break) Use the !process command to confirm that you are now running a different process. VadRoot ffffe001d402b820 Vads 438 Clone 0 Private 13417. Modified 87866. Locked 64. The output above shows that a different system process of ffffe001cd0ad040 is running. The image name shows System, not audiodg.exe. Now use the !process command to switch to the process that was associated with audiodg.exe. In the example, the process ID is ffffe001d147c840. Substitute the process ID in the example with your process ID, that you recorded earlier. VadRoot ffffe001d4222f70 Vads 60 Clone 0 Private 299. Modified 152. Locked 0. Because this code is not active, all of the threads are in WAIT state, as expected. The commands to view and set threads are very similar to those of processes. Use the !thread command to view threads. Use .thread to set the current threads. To explore threads associated with the media player, play the media clip again. If the breakpoint described in the previous section is still in place, you will stop in the context of audiodg.exe. Use the !thread -1 0 to display brief information for the current thread. This shows the thread address, the thread and process IDs, the thread environment block (TEB) address, the address of the Win32 function (if any) the thread was created to run, and the thread’s scheduling state. To view more information about the thread that is running, type !thread. Information similar to the following should be displayed. Use the k command to view the call stack associated with the thread. Enter g into the debugger to run the code forward until the media clip is done playing. Then break in to the debugger, by pressing Ctrl - ScrLk (Ctrl-Break) Use the !thread command to confirm that you are now running a different thread. The image name is rundll32.exe, which is indeed not the image name associated with playing the media clip. Note To set the current thread, type .thread <thread number>. In Section 11, you will display the IRQL, and the contents of the regsisters. The interrupt request level (IRQL) is used to manage the priority of interrupt servicing. Each processor has an IRQL setting that threads can raise or lower. Interrupts that occur at or below the processor's IRQL setting are masked and will not interfere with the current operation. Interrupts that occur above the processor's IRQL setting take precedence over the current operation. The !irql extension displays the interrupt request level (IRQL) on the current processor of the target computer before the debugger break occurred. When the target computer breaks into the debugger, the IRQL changes, but the IRQL that was effective just before the debugger break is saved and is displayed by !irql. Display the contents of the registers for the current thread on the current processor by using the r (Registers) command. Alternatively, you can display the contents of the registers by clicking View > Registers. Viewing the contents of the registers can be helpful when stepping through assembly language code execution and in other scenarios. For more information see r (Registers). For information about contents of the register, see x86 Architecture and x64 Architecture. You can disassemble the code that is under execution to view the assembly language code that is being run by clicking View > Disassembly. For more information about assembly language disassembly, see Annotated x86 Disassembly and Annotated x64 Disassembly. In Section 12, you will use debugger commands to display the contents of memory. You may need to examine memory to identify an issue or to inspect variables, pointers, and so on. You can display memory by typing one of the following d* <address> commands. Displays data in byte values and ASCII characters. Displays data as double wide words (4 bytes). Displays data as Unicode characters. Displays data as word values (2 bytes) and ASCII characters. Note If you attempt to display an invalid address, its contents are shown as question marks (?). Alternatively, you can view the memory by clicking View > Memory. Use the Display format pull down to change how the memory is displayed. To view data associated with the volume control, set a breakpoint to fire on the PropertyHandlerAudioEngineVolumeLevel routine using the bm command. Before we set the new breakpoint, we will clear all of the previous breakpoints using bc *. Set a breakpoint to fire on the PropertyHandlerAudioEngineVolumeLevel routine using the bm command. Use the g command to restart code execution. On the target system adjust the volume in the system tray. This will cause the breakpoint to fire. Use the View> Local menu item to display local variables. Note the current value of the IVolume variable. You can display the data type and the current value for the IVolume variable in the sample code by typing the dt command and the name of the variable. The breakpoint is hit on entering SetDeviceChannelVolume. // Snap the volume level to our range of steppings. Attempt to display the value at the memory location of IVolume by using the dt (Display Type) command. Because the variable is yet to be defined, it does not contain information. Press F10 to run forward to the last line of code in SetDeviceChannelVolume. Display the value at the memory location of IVolume by using the dt (Display Type) command. Now that the variable is active, a value of 6291456 is displayed in this example. You can also display the memory location of IVolume by using the ? (Evaluate Expression) command. The address shown, ffffb780`b7eee664 is the address of the lVolume variable. Use the dd command to display the contents of memory at that location. You can display the first four bytes of an address by specifying the range parameter L4. To see the different types of memory output displayed, type the du, da and db commands. Use the df float option to display data as single-precision floating-point numbers (4 bytes). Similar to the commands that are used for reading memory, you can use the e* commands to change memory contents. The following example shows how to overwrite memory. First, locate the address of the lVolume that is used in the sample code. Overwrite that memory address with new characters using the eb command. Display the memory location to confirm that the characters have been overwritten by typing the db command. ffffb780`b7eee664  11 11 11 11 11 00 00 00-00 00 00 00 08 70 2d c5  .............p-. ffffb780`b7eee674  8e c9 ff ff 56 57 49 e0-0e f8 ff ff 08 70 2d c5  ....VWI......p-. ffffb780`b7eee6a4  80 b7 ff ff 00 00 00 00-00 00 00 00 60 72 47 c7  ............`rG. Alternatively, you can modify the contents of the memory in a watch or locals window. For the watch window, you may see variables that are out of context of the current frame. Modifying them is not relevant if they are not in context. To end a user-mode debugging session, return the debugger to dormant mode, and set the target application to run again, enter the qd (Quit and Detach) command. Be sure and use the g command to let the target computer run code, so that it can be used. It also a good idea to clear any break points using bc \*, so that the target computer won't break and try to connect to the host computer debugger. For more information, see Ending a Debugging Session in WinDbg in the debugging reference documentation. Additional information is available on Windows debugging. Note that some of these books will use older versions of Windows such as Windows Vista in their examples, but the concepts discussed are applicable to most versions of Windows.